A large dish of pasta primavera. As the Food Network explains, pasta primavera is a recipe that combines bowtie pasta with a variety of vegetables, such as zucchini, carrots, bell peppers and squash. 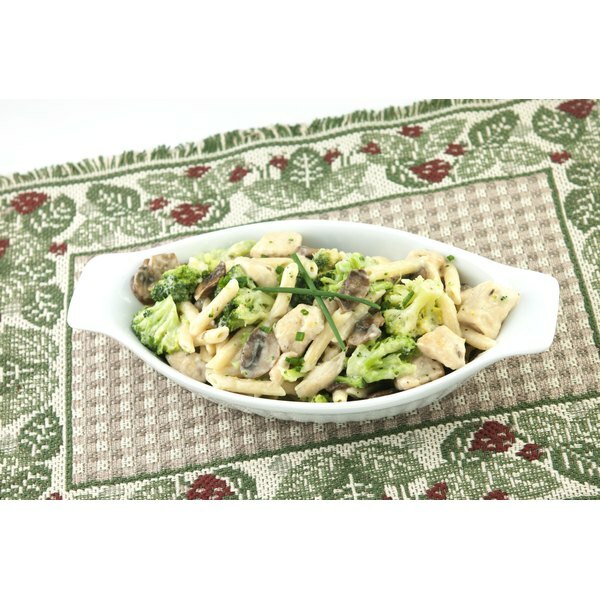 The lack of a creamy sauce or meatballs helps keep pasta primavera relatively low in calories. LIVESTRONG.COM MyPlate notes that 1 cup of pasta primavera contains about 223 calories. This is 11 percent of the daily suggested intake of 2,000 calories, and the Mayo Clinic explains that it would take more than 60 minutes of lifting weights to burn off that many calories. Fat is calorie-dense, providing 9 calories per gram. According to LIVESTRONG.COM MyPlate, 1 cup of pasta primavera contains 5.1 g of fat. Of this fat, less than 2 g comes from saturated fat, which is considered to be unhealthful. One cup of pasta primavera contains about 15 g of carbohydrates. Of these carbohydrates, 4 g come from fiber. The National Library of Medicine and National Institutes of Health explain that fiber makes you feel full, so it may be a helpful food if you're dieting. A 1-cup serving of pasta primavera contains about 8 g of protein. Protein contains amino acids, the building blocks of your body's tissues.